Our family fell in love with Anna Maria Island the first time we visited in 1989. Every summer since, we’ve spent our vacations on this island, and in 1995, we bought our first condo here. Having a young family at the time meant we had to rent our condo to offset ownership costs. Thankfully, by offering luxurious accommodations at an affordable price, we were able to keep the condo booked for an average of 50 weeks a year. These steady bookings allowed us to purchase our second condo in 2013, and a third in 2014. While opening up these homes has allowed us to keep returning to the island���and even better, to a house that feels like home—we also truly enjoy offering a place to guests to discover Anna Maria Island and feel at home here, too. More than anything, we appreciate that positive reviews from past guests determine the award winners. If you decide to rent from us you will receive a new state of the art 14 page digital travel guide plus prior to your arrival you will receive a digital welcome package delivered directly to your phone, tablet or computer containing all the information you will need for your vacation including directions, your 4 digit code to the remote keyless lock, how to work the A/C, how to work the television and appliances, a guide to the best restaurants, a shopping guide, the coolest local tours, ATM machines, grocery stores, the free trolley, boat rentals, things to do and much, much more. The feedback we are receiving from guests is they love this welcome package. When they are out and looking for something to do or some place to eat or looking to plan next day activities all the information they need is at their finger tips. The beach re-nourishment has just been completed. We are proud to offer you the most beautiful beach you will find anywhere in the world and our own private beach access as well. Please refer to our photo gallery. Our Florida beach vacation condo provides you with two full size washrooms with freshly laundered towels, spotlessly clean and polished. Our kitchen is contemporary designed with white cabinets, granite counter tops, European lighting, whitewash rattan glass table and Floridian designed rattan chairs. The kitchen offers all amenities including refrigerator and freezer, ice maker, stove, dishwasher, microwave oven, garberator, pots and pans, cookware, dishes, utensils, coffee cups, glasses, blender, coffee maker, food processor and toaster. Our Anna Maria Island vacation rental condo provides you with additional amenities including HIGH-SPEED INTERNET, washing machine and dryer, telephone with unlimited local calls, answering machine, ceiling fans in every room, iron and ironing board, alarm clocks, cable television, patio furniture, beach chairs, beach toys, playpen, outdoor shower, private sheltered parking to keep your car out of the intense Florida sun and private beach access. No expense spared in this totally remodelled unit with great views of the gulf. New walkin showers,new kitchen appliances, top of the range furnishings in every room and all you need for the beach which is steps away. Terry is always at the end of the phone or email. Thank you for the awesome review and thank you again for being our guests. It has been a pleasure working with you as always and we hope you will come back and stay with us again sometime soon. Terry was very pleasant to work with and he wants to ensure his customers are happy. I'd recommend . Thank you for the nice review it is very much appreciated and thank you again for being our guests. What an amazing condo and what an amazing experience. The condo and the views from the condo are spectacular. Love this place. The condo itself was very nice. However, we were very disappointed to find out that the main frontage picture used on the website of the complex does NOT show a road between the complex and the beach that you have to cross to get to the beach. It looks like the condo is directly on the beach when looking at this picture.Very much deceiving! In addition, I contacted Terry after hearing about red tide in this area a couple of times via email prior to our arrival including the very morning before we checked in pertaining to the red tide and asked if it was at this property in Bradenton beach. I was told that there was no red tide here on Anna Maria and Bradenton beach. Upon our arrival, Immediately, the foul smell of the dead fish was terrible. I walked behind the complex and notice many dead fish floating in the water.The beach was unsafe with a rust color foul smell, and dead fish on the beach as well. I immediately called Terry to see if we had any options on any reimbursement of any kind or something since red tide is very unhealthy not just for myself but for my family including my 83 year old mother that was with us.He said that therr are many other things to do other than the beach and that he would look into a possible discount? I never heard back from him. I was very much misinformed. I spoke with Terry by phone and said that myself and my family came here to enjoy the beach and not go to tourist attractions and or do other things as he suggested. I realize the red tide isn’t something that can be controlled or anticipated at the time we arrived but do feel that I should of never been told that there was no red tide when there was upon our arrival. Anna Maria Island is located on Florida’s Gulf coast 40 miles south of Tampa Bay and 7 miles west of Bradenton Florida. The island is the northern most of a string of barrier islands that stretch southward direction toward the Florida Keys. Surprisingly Anna Maria Island comprises three very unique cities (villages), Bradenton Beach on the southern tip, Holmes Beach in the middle and Anna Maria on the northern tip. The sugar white sand beaches and crystal blue waters extend the entire length of the islands seven miles coast line. This isn’t a place where you go to the beach, when you are on Anna Maria Island you are at the beach. The island rimmed with towering Australian pines, some as high as 60 feet, magnificent palms, sea oats swaying in the Gulf breeze. 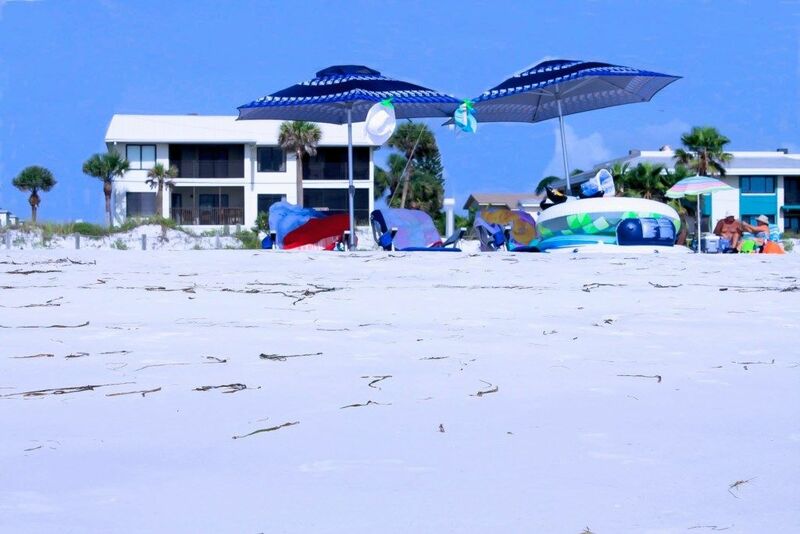 This tropical paradise offers you seven miles of unspoiled white sand beaches, 150 miles of waterfront, free trolley service, waterfront restaurants, 3 waterfront parks and 4 gorgeous beaches. Golf: Golf is also another favorite pastime, and with more than two dozen public and private courses from which to choose – not to mention at least 200 more within a short drive – Manatee County and its neighboring communities are a virtual golfing paradise. Our Florida beach vacation condo is located within 10 minutes of the internationally famous David Leadbetter IMG Golf Academy and Nick Boliterie Tennis Academy both located in Bradenton Florida. Our neighboring cities play host to year-round excitement with training and seasonal games for teams like baseball’s legendary Pirates , Red Sox and the Tampa Devil Rays as well as Super Bowl champions Tampa Bay Buccaneers as well as the Stanley Cup winners of the Tampa Bay Lighting. Tampa is 35 miles to the north, where you will find Bush Gardens. Tampa also has the University of South Florida Botanical Gardens, the Florida Aquarium, Ybor City, the very elegant Henry B. Plant Museum and the Museum of Science and Industry. The most famous Mouse in the world and all the Orlando attractions are only a two hour drive to the northeast. After a day at the Orlando Theme parks our Anna Maria Island beach condo provides you with peace and tranquility to reflect on your memories.